Tourism industry in Lapland keeps on growing. Check out the infographic below for more details. 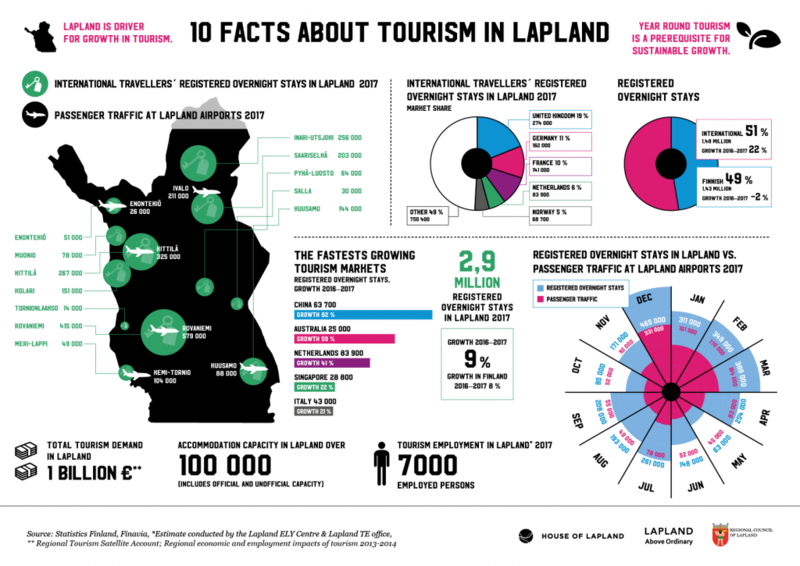 View a full-sized version 10 facts about tourism in Lapland 2018 of the infograph here. From 2016, international overnight stays (1.48 million) grew 22%, overtaking domestic overnight stays (1.43 million). China topped the fastest growing markets, ranking 6th for overnight stays. Overall, there were 2.9 million overnight stays in Lapland in 2017, a 9% growth from 2016, and 1% more than Finland overall. In all, the total tourism demand in Lapland reached 1 billion euros in 2017 and employed 7,000.